I saw an early prototype of the ThunderBird a few years ago at Trail Days in Damascus, Virginia. It was a great opportunity to meet up with Randy, who I’ve built a friendship over the past few years. Dream Hammock has become very popular over the past couple of years, due in part to being extremely customizable, modular, and comfortable—in addition to having a great, user-friendly website. All the hammocks are custom-made by Randy and his wife Deanna in their home workshop, and they have made a point of showcasing each creation on their website. One thing I love about cottage vendors is their attention to detail, high-quality, and the hands-on approach to every facet of the business. 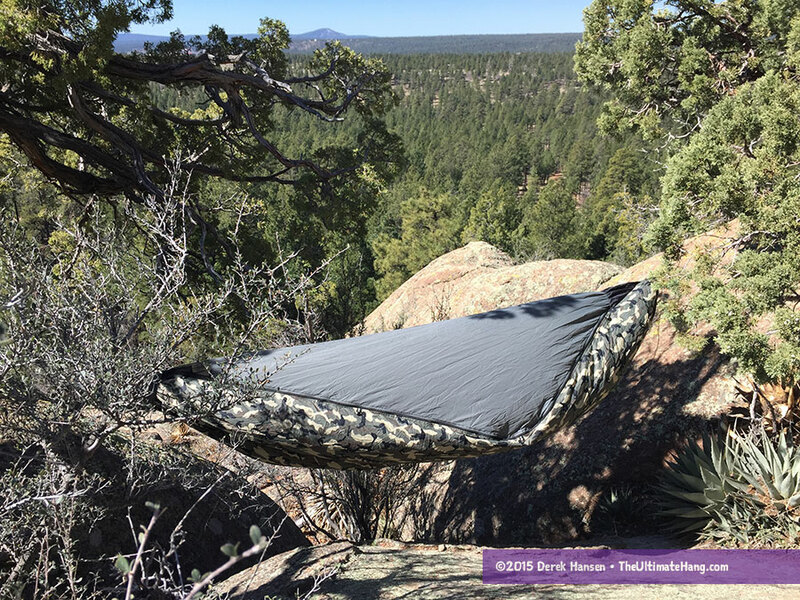 The ThunderBird is the flagship hammock from Dream Hammock and has the most included features, including a modular, removable bug net and over cover, dual-zippers, and built-in under quilt and pack hooks. There are a variety of add-ons such as storage pockets, gear loops, peak shelving, and organizers that can be added to any of the Dream Hammock models. Randy sent me a custom ThunderBird model as it is the showroom model for all the other versions on his site. Because each hammock is custom-made, it is difficult to pin-down “stock” weights and dimensions since there aren’t any. Randy makes a point to provide options and his website does a good job of calculating estimated weights as you make selections. As with any custom-made gear, recognize that there is rarely anything “on the shelf,” so allow enough time for manufacturing, shipping, and handling. The hammock comes read to hang, but you’ll need to supply your own tarp to complete the camping hammock set-up. 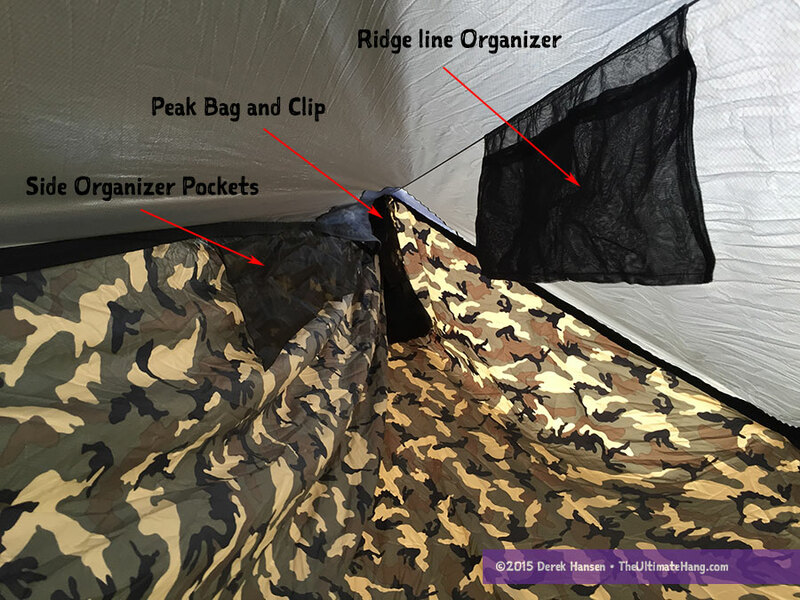 The version Randy sent me to review has just about everything you can customize, including a ridge line organizer and a side pocket organizer. The fabric has a nice hand, and I really like the 1.6 oz Hyper-D Diamond Ripstop material in this model—it has a nice lay and low-to-mid stretch (nothing that really bothers me or stands out, just comfortable). The ThunderBird was the first hammock I’m aware of to feature a modular design, with an integrated, interchangeable and removable bug net and over cover (the Clark Jungle Hammocks were the first to have a winter cover built-in, but not removable). It was the talk of Trail Days when Randy debuted it. He has since refined the design over the past few years, and I am still amazed at how he can offer so many custom options on all his hammocks. There have been a few other hammocks that offer modular designs like this, including the Warbonnet Blackbird XLC, several Clark Jungle Hammocks, and the Hammeck Envy-S. Each has its own singular features that make them unique. The suspension system is customizable too. Mine came with Whoopie Slings installed directly into the end channels. You can also order continuous loops (which is my preference), and cinch buckles. 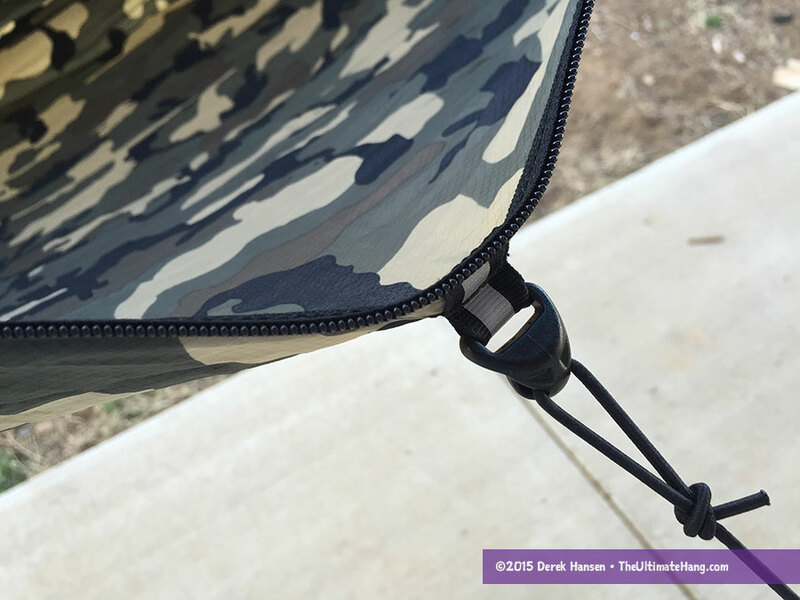 The ridge line organizer is made from 0.75 oz black no-see-um netting and has three pockets on each side plus a long pocket through the center. Just like the hammock, this organizer has a lot of options. Randy also installed a side storage pocket that has three organizers. This is actually a handy and not too obtrusive since it is installed on the “wall” of the hammock, opposite my head. The over cover is a really nice feature. Not only does it provide a more 4-season camping experience by providing better wind protection and dead air space, the cover also offers a nice privacy option, which is lacking in most hammocks. 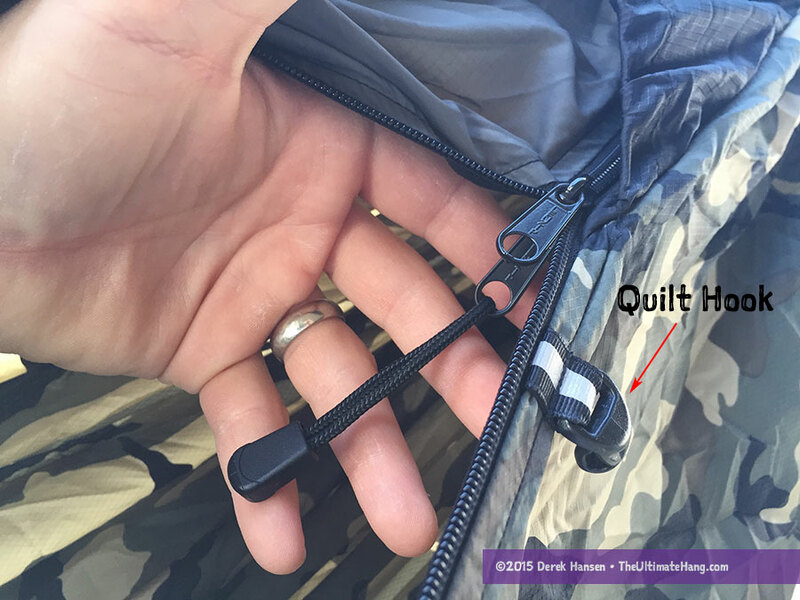 In my experience, the ThunderBird has the best zipper design of the modular hammock’s I’ve tested. There are two full-length zippers on each side, and no hard corners. This means the zippers track smoothly along the entire length of the hammock. The rounded corner design at the asymmetric pull-outs allows the zippers to glide without any difficulty. One small detail that really caught my attention was the addition of a cord to the inside zipper pulls. This really makes it easier to grab and close up the hammock once I’m inside. I usually have to retrofit hammocks to add this small detail, so I was smiling when I saw Randy had already done the work. There are four pack hooks sewn on reflective grosgrain ribbon loops, two on each side of the hammock. 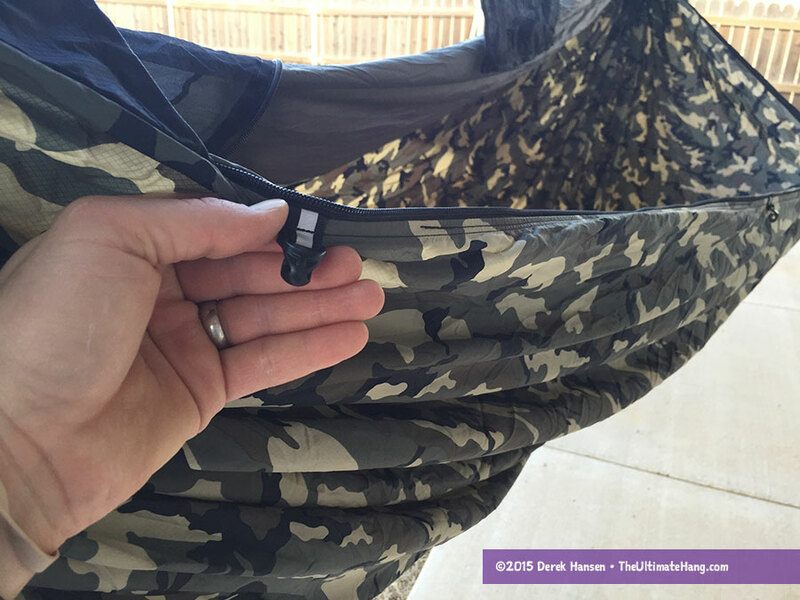 The hooks located closest to the ends of the hammock are designed to help position and hold an under quilt in place and provide a better seal. The other pack hooks are used as side pull-outs and can be used to create an asymmetric lay, aligned with the bug net or over cover. Two removable, six-foot-long 3/32 shock cords are included as self-tensioning yet strain-relieving pull-outs. The ThunderBird is a high-quality hammock, and Randy has really perfected the design. This is evident in the zipper placement and all the accessories fitted neatly together. This hammock design is perfect for folks looking for an all-in-one, do-it-all hammock, thanks to the modular design and removable top covers. It’s also a great option for folks who value fine craftsmanship and made-in-the-USA sentiment. If I were to make one change on this hammock, it would be to switch out the Whoopie Slings with just continuous loops on the ends. This is more a personal preference than anything, as I find ends loops to be the most versatile, and a little easier to manage when I’m packing up the hammock at the end of the day. The Whoopie Slings tend to get in the way a little for me as they protrude from the double-sided stuff sack. Overall, a great, well-thought-out hammock that deserves the high praise I hear from satisfied customers across the globe. Looks very nice. I’ve had one of his hammocks on my list since i first saw it on hammockforums several years ago. Love my DH roaming gnome! How can I install continuous loops? New video coming?!! Great review. I’m thinking of getting a Dream Hammock but am a bit confused on what width to get. Do you know the width of the T-Bird you reviewed? I believe it is 60 inches. 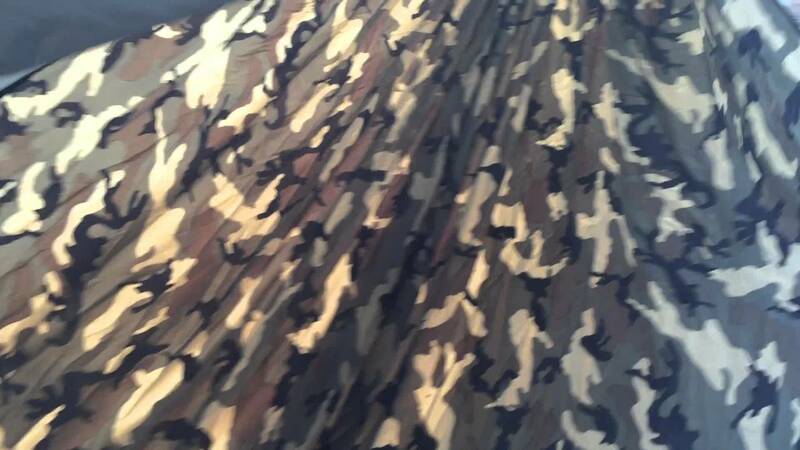 It depends on which fabric you pick too, but it’s all listed when you go through the ordering process. Great review. I had the honor of winning a hammock at the Florida hang and chose the Thunderbird. I gotta say it’s a great hammock and extremely well-made. I love the modularity of it. I haven’t needed the netting yet but the overcover absolutely cut a number of degrees off the inside temp (as well as keeping the blowing wind off me). I absolutely love the 1.6 HyperD material. It feels very nice. I opted for coyote and it’s a gorgeous hammock. With the assem pullouts on the DH is the lay flatter for a diagonal lay. In your opinion can you lay nearly as flat as a warbonnet XLC. I love the WB XLC but I also like the DH zippers and options. The side pullouts help open up the fabric and do more to keep the bug netting off your face and legs and make the whole hammock feel larger inside. The size of the hammock has more to do with the flat lay than the pullouts. The Warbonnet and DreamHammock are built with similar dimensions and have a similar lay. Derek, thanks for the reply and most of all thanks for this great site and the wealth of information. I am seriously honking about getting a Dream hammock thunderbird and giving it a season of use. I have your book and have read it more than a couple times. I have converted some tent campers just armed with your book. I am a convert and love flying into the Alaska bush and hanging from my plane. Thanks. DH has come out with a new flagship hammock, the Sparrow. I don’t know if there is any way to improve the Thunderbird, but I think it would be awesome if you could do a review on it. I ordered my new DH a few weeks ago and I can’t wait to hang in my DH Thunderbird. It should be arriving mid June. I also selected the 1.6 HyperD material in double layer. Top cover and bug net too. Love the available custom options they offer and I have to say Randy and Deanne are just super easy to deal with as a vendor. Deanne is so nice. She gave me some great advice and feedback that I was looking for on my first custom hammock purchase.